ERMINUS (ERMIN), following the completion of his studies at the Cathedral School of Laon, and ordination to the priesthood, St. Erminus received monastic tonsure from St. Ursmar (19th April) at the Abbey of St. Peter of Lobbes, Hainaut, in present-day Belgium. Following nomination by St. Ursmar, St. Erminus was elected second Abbot of Lobbes in 718. He was known for his personal holiness, gift of clairvoyance, and wisdom. St. Erminus reposed in 737. EVODIUS, HERMOGENES, and CALLISTA, (Date Unknown), listed in the oldest of martyrologies as having been martyred in Syracuse in Sicily. There is no further information extant. Some martyrologies list them on 2nd September. HERIBALDUS, raised in the Court of Charlemagne, St. Heribaldus received monastic tonsure at, and later served as Abbot of, the Abbey of St. Germanus in Auxerre. He was the first chaplain to the royal palace. Following the repose of his uncle, St. Angelelmus (7th July), Bishop of Auxerre, in 829, St. Heribaldus, with significant support from Louis the Pious, was consecrated Bishop of Auxerre. St. Heribaldus reposed circa 857. MACAILLE, Bishop of Croghan, Co. Offaly, Ireland, St. Macaille was a disciple of St. Mel of Ardagh (6th February) and assisted him in tonsuring St. Brigid of Kildare (1st February) into the monastic life. He reposed circa 489. MELLA, Following the repose of her husband, St. Mella received monastic tonsure and eventually became Abbess of Doire-Mells in Leitrim. Our knowledge of this saint is based upon the limited information available from Colgan, and the Bollandists who place her firmly in the eighth century. Yet both sources state she was the mother of two saints; Cannech (11th October) and Tigernach (4th April), who are generally accepted to have lived in the sixth century. PHAEBADIUS (PHÉBADE), the first historically documented Bishop of Agen. He was close friends with St. Hilary of Poitiers (13th January) he fought Arianism and authored the still extant Contra Arianos (Against Arianism) . St. Phaebadius is also one of the men St. Jerome profiled in De Viris Illustribus (On Illustrious Men) . St. Phaebadius reposed circa 392. 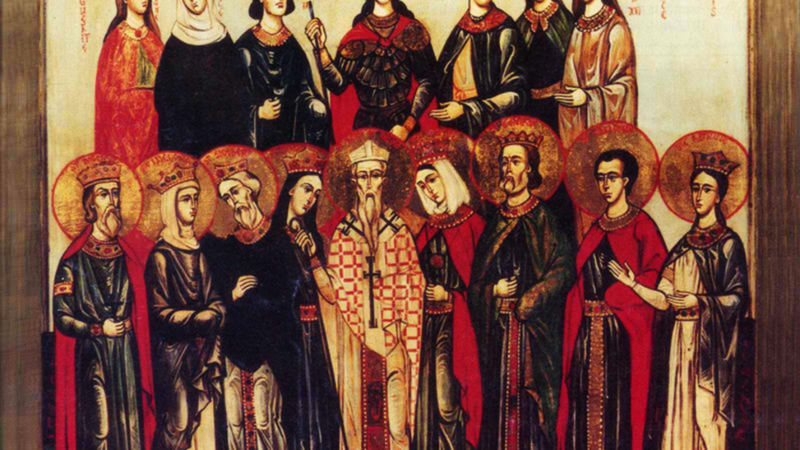 ROBERT of SYRACUSE, abbot of a monastery in Syracuse in Sicily who reposed circa 1000. Nothing further is known of his life.